The White House admitted today that President Obama made no phone calls–none, zero–on the evening of September 11, 2012, during the seven or eight hours when Americans were being murdered in Benghazi. He didn’t talk to Leon Panetta, or any military personnel, or Hillary Clinton. What was he doing that night? We may never know; perhaps writing the speech that he gave at a campaign event the next day in Las Vegas. Information on Benghazi has to be pried out of the administration with a crowbar; Lindsay Graham got the White House to identify the calls that Obama made that night–none–by holding up Chuck Hagel’s confirmation. Graham says he will put a hold on John Brennan, too, until he gets more facts on Benghazi from the stonewalling White House. Good for him. 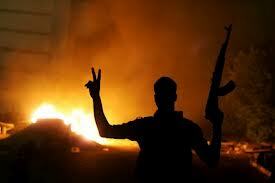 The administration’s quiescence in the face of the terrorist attack in Benghazi has always seemed inexplicable. Why didn’t anyone try to help the besieged Americans over the course of that long night? Leon Panetta and General Martin Dempsey testified on Benghazi before the Senate Armed Services Committee last week, but their account made no sense. They said that no help was dispatched to try to save the Americans because 1) the State Department never requested it, and 2) there wasn’t enough time. But there was plenty of time, seven or eight hours before the last two Americans were finally overcome. This is an embarrassment and a disgrace. Is it too much to hope that President Obama is privately ashamed of his inattention and passivity that night? I think he is ashamed. Here’s what I’ve been assuming happened: It looked like our people were overwhelmed and doomed, so there was shock, sadness, and acceptance. But then the fight went on for 7 or 8 hours. The White House folk decided there was nothing to do but accept the inevitable, and then they witnessed a valiant fight which they had done nothing to support. It was always too late to help. It was too late after one hour, then too late after 2 hours, then too late after 3 hours…. When were these people going to die already? After that was all over, how do you explain what you did? I, too, hope that Obama–and Hillary Clinton, also–have the decency to be ashamed of themselves.